Community property. Ademption. Two terms any Arizona probate Attorney is familiar with. Lets look at these terms. Any real or personal property acquired during marriage is subject to community property law. That includes Arizona and a dozen other states. What kind of property does this consist of? Cars, boats, and jewelry. Real estate, and any other item purchased by a married couple also comes into play. Community property also includes debt, not just assets. So if he jacks up his credit cards while married to her this impacts both people. Both are responsible for debts acquired while married. Here is a short list: credit card, auto, mortgage, and all other credit debt. Legal Zoom says “Under community property, spouses own – and owe – everything equally, regardless of who earns or spends the income.” That’s a pretty good description. Property and debt acquired before a marriage are not part of community property. It does have limits. Here’s an example. Inherited items are not community property. Be aware that once property is deeded into a spouses name it then is community property. 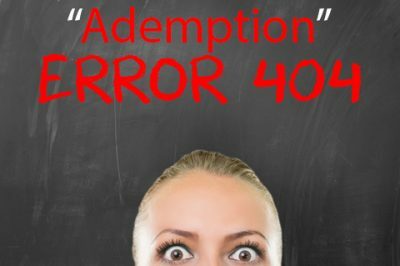 When you hear the word “ademption” think 404 error message. Like the one you see on a computer . When a page no longer exists that once did. That’s easy to remember. Legal minds will like the following explanation much better. Ademption is a term common in laws that govern Wills. Here’s what it means. Ademption means that a possession promised to be given in a Will is no longer part of the estate, because it was given away or sold prior to the time of death. An example of ademption could be a car that is totaled in an accident. The car would not be available to give away any longer since it doesn’t exist any more. Got that? There is yet another explanation of Ademption in the glossary. Go see that. Most of the common probate terms are in there too.